In addition to daily brushing and flossing, you know you can help protect your oral health by seeing your Bondi Dental dentist regularly for checkups. We recommend that most people get a dental checkup every six months, but we might also recommend more frequent or fewer visits, depending on your dental health history. And those checkups do more than just protect your oral health; they also protect your general health. You might be surprised at what your Bondi Dental dentist is looking for beyond the opportunity to check out your gums and teeth. Let’s take a look at seven things Bondi Dental looks for that you might not know about. Crohn’s Disease. This is an inflammatory bowel disease, and up to 20 per cent of patients with it develop oral lesions that may even occur before symptoms such as cramps and diarrhea. A 2010 study from the Medical University of South Carolina in Charleston reveals symptoms such as swollen lips and dime-sized ulcers inside the cheeks and lips. If these symptoms are present, we check for gum disease, and if it is ruled out, we’ll explore your medical history and medications, before recommending you see your regular doctor. Look at your tongue. It’s not only your lips and cheeks that can reveal general problems, but it’s also your tongue. A healthy tongue should be covered with small nodules and have a pink colour. If we see something different, we take a closer look. Luckily, that majority of causes of tongue problems do not indicate anything serious, but in some cases, a painful tongue may indicate vitamin deficiencies, oral cancer or Acquired Immune Deficiency Syndrome, or other diseases. Search for signs of early dementia. The gradual onset of dementia often begins with memory loss, disorganisation, confusion, and an unhealthy mouth. This is because the early stages of dementia may lead to poor oral hygiene practices at home. The relationship seems to work both ways as some studies indicate that oral hygiene itself may be a risk factor for dementia. A study by researchers at the University of California tracked over 5,000 older adults for 18 years discovering that those who brushed their teeth less than once a day could be up to 65 per cent more likely to develop dementia. Heart problems. Inflamed gums and loose teeth can be related to heart disease. Gum diseases like periodontitis can create bacteria that can travel to your heart and contribute to coronary artery disease. Bacteria may also raise the risk of heart disease by contributing to blood clot formation or further arterial plaque build-up that can interfere with blood flow to the heart. A study in Sweden discovered that people with more pockets of infection in the gums surrounding the base of the tooth increased their risk of heart attack by 53 per cent. Assess your routine oral hygiene habits. By inspecting your gums, tongue, teeth, and surrounding tissues, Bondi Dental staff can assess what parts of your at-home oral hygiene program are working and what needs more attention or better technique. For instance, if you show signs of enamel erosion and receding gums, it could be that your daily brushing is too vigorous. 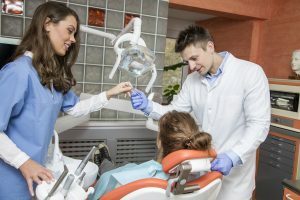 Our staff will inquire about your dental hygiene habits and suggest new techniques and tools as we feel they are appropriate. Check for Gastroesophageal Reflux Disease (GERD). Erosion of enamel from the interior faces of teeth, especially the upper back molars, can be a sign of gastroesophageal reflux disease. In many cases, patients may not be aware they have GERD as reflux of stomach juices often occurs during sleep. Because GERD can cause esophageal erosion and even esophageal cancer, it is important to catch it early. Check for Osteoporosis. Osteoporosis is a weakening of the bones, most common in post-menopausal women and the elderly. And it’s possible your dentist can spot symptoms of it even before you do. While osteoporosis does not cause changes in teeth themselves, it does cause harmful changes in the jawbone supporting them. This may express itself as loose teeth and a receding gum line. In fact, these are only some of the conditions that your dentist can catch early. And this is important because in most cases catching these conditions early leads to less expensive, less invasive, and ultimately more successful treatment outcomes. Just another reason to make an appointment for a checkup at Bondi Dental! FREE Consultation for Checkup, Dental Implants, Cosmetic Dentistry, Smile Make-over, Invisalign, and Inman Aligner.